One staple order whenever we visited any Thai restaurant in Mumbai used to be Chicken Tom Yum Soup or simple Tom Yum Soup. My taste for Thai food took its shape in Mumbai only. Then when we visited Bangkok and Pattaya, we relished to the utmost satisfaction of our heart various Thai delicacies among which Egg Fu Yong or Chicken Fu Yong, stir fried Thai noodles caught my fancy. Yesterday night for dinner I was in a mood to concoct a Thai dish. It's been years precisely when I last had Tom Yum Soup anywhere. So I combed the cyber world vigorously in search of an authentic Tom Yum Soup. Some of the ingredients mentioned in the recipes were to be found only in exclusive Thai retail stores, like galangal, a sort of Thai ginger which is not easily available in World Churchill Market or Wal-Mart. So I had to list such ingredients off my list due to the difficulty in availability and finally I came up with my own recipe putting together whatever I managed to get in hand. Nevertheless, even with limited ingredients, the taste of the soup was not compromised and the turnout was really delectable and savoury. Me and my hubby thoroughly relished it. 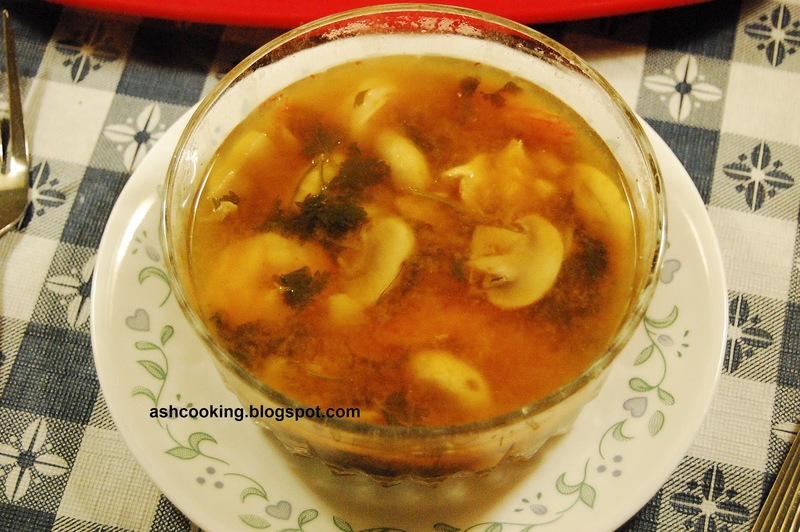 1) In a saucepan, put together chicken stock, prawns, button mushroom and ginger. Bring it to a boil. 2) Add fish sauce, garlic chilli sauce and herbs. Simmer it away till mushroom is tender. 3) Toss in the shredded chicken and add salt. Simmer it for couple of more minutes. 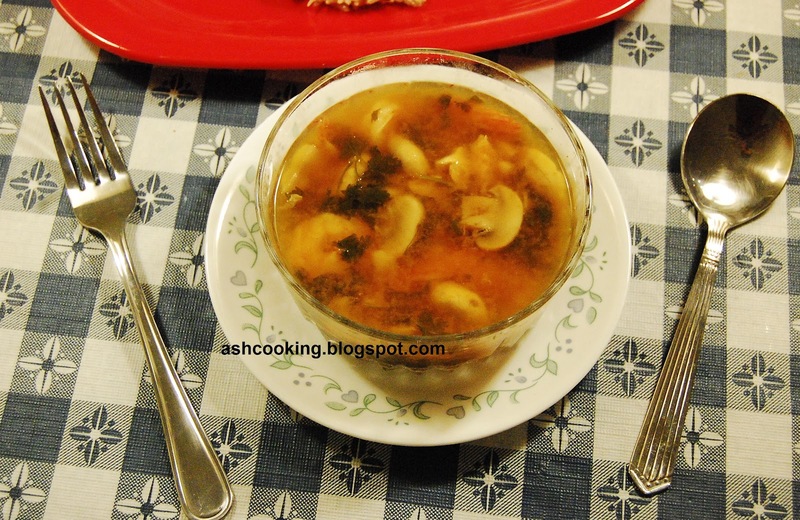 4) Squeeze lemon juice into the soup before serving.